Modeling Clay Miniatures - Turn Your Paupers into Princes Over-Knight! Modeling Clay Miniatures - "Sculpting is probably the finest art in the Games Workshop hobby. Unlike painting, you start with nothing in your hands but two strips of blue and yellow stuff, and if you have patience you will watch your miniatures grow steadily, from the very beginning of knitting the Green Stuff together and to the final touches." 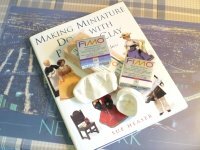 - Read the rest of this interesting article about Sculpting your own Modeling Clay Miniatures. Working with polymer material and many other varieties is easy and safe for children and adults. 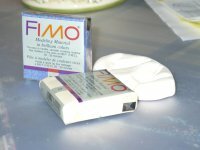 Polymer is very versatile in that it lends itself to be stamped, sculpted, embedded, painted, sanded and even drilled. So in other words it can be used in just about any crafting project. Different substances can be mixed with these compounds as well to create a more desirable effect. Mixing these kinds of material into your clays are especially useful in creating faux stones. Imagine your dollhouse exterior with some of these stones cleverly worked into your outside landscaping. Polymer is not edible so do not make items you would serve food in. Any kitchen tools used in construction of your items should not return to the kitchen for further use by you in preparing meals. Never use a polymer constructed item for an ashtray or incense burner. Bake polymer in a well ventilated room. Don't eat while making your craft projects to avoid accidental ingestion of the modeling material. Wash hands well after handling polymer. Speaking though of how versatile this modeling material really is, I have to mention, my own experience. I have done some modeling projects but in recent years like some people, I temporarily stopped. That said, I had always thought that my modeling compounds, which lay quite unused, would be garbage by now. My only conclusion for it was that one day I would literally open a garbage bag and finally say goodbye to all my modeling clay miniatures supplies. But the versatility is amazing! After years of laying dormant and unused I decided one day to get it out and check to see if there was any hope at all. To my surprise it was still in the pliable state it had been in, back when I had done projects with it. Like I said amazing! So don't just chuck it away. There may be hope for your supplies as well. Crafting supplies after all are very versatile! Stock up on your Project Supplies here. Then after viewing those click here as well.